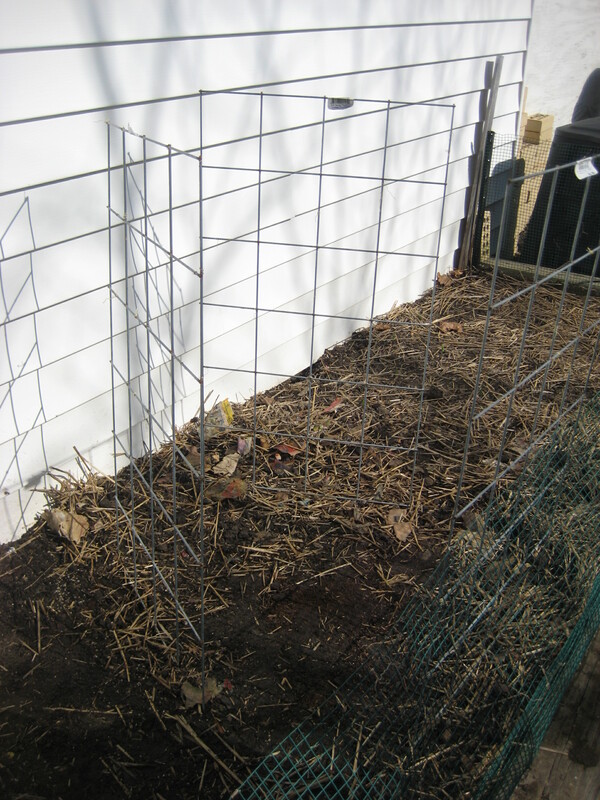 Photos from the third week of March. 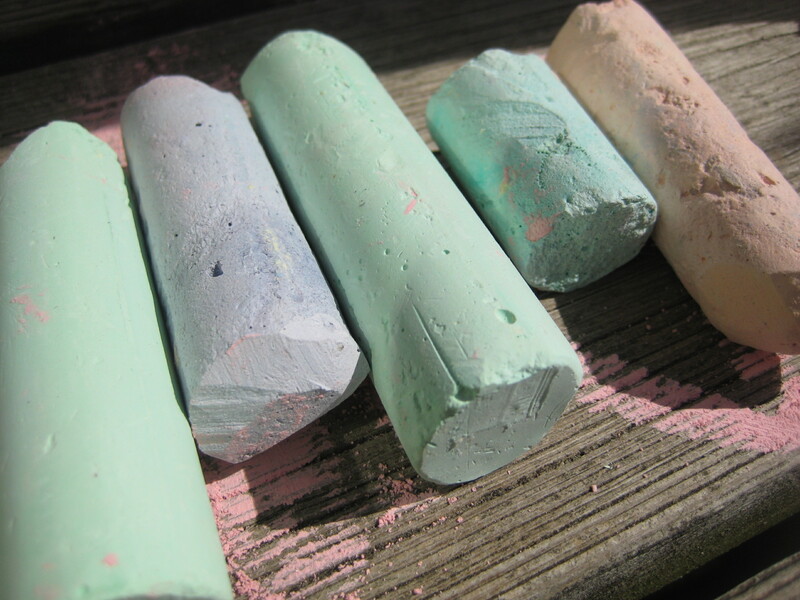 Sidewalk chalk outside with the kids. 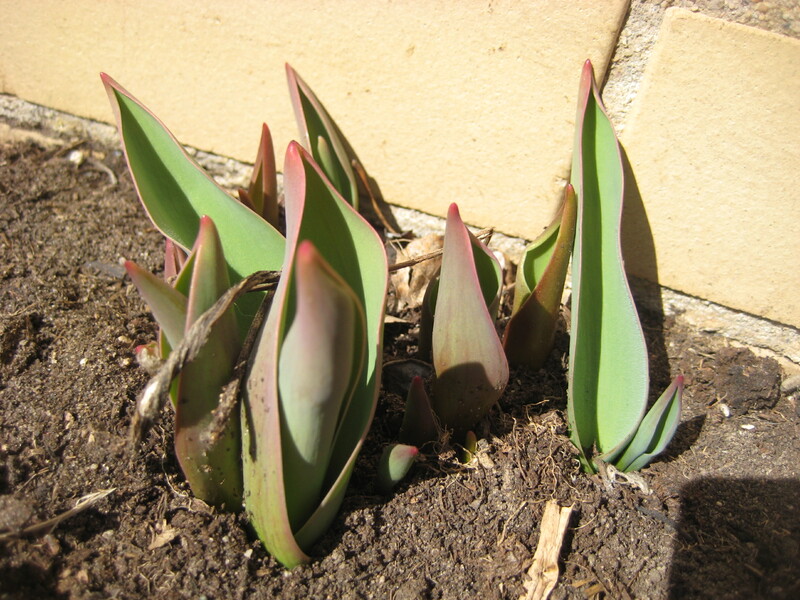 More tulips, a welcome sign of spring. 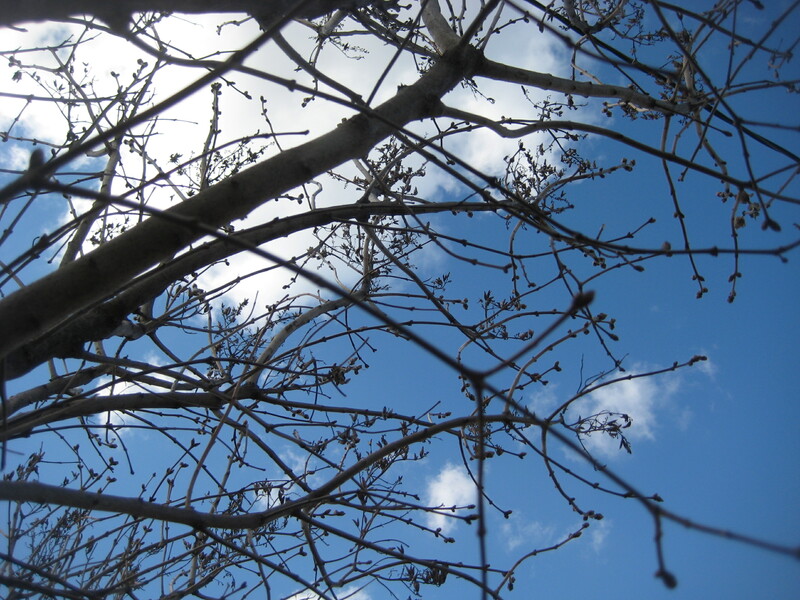 Rising temperatures made for a very pleasant week. 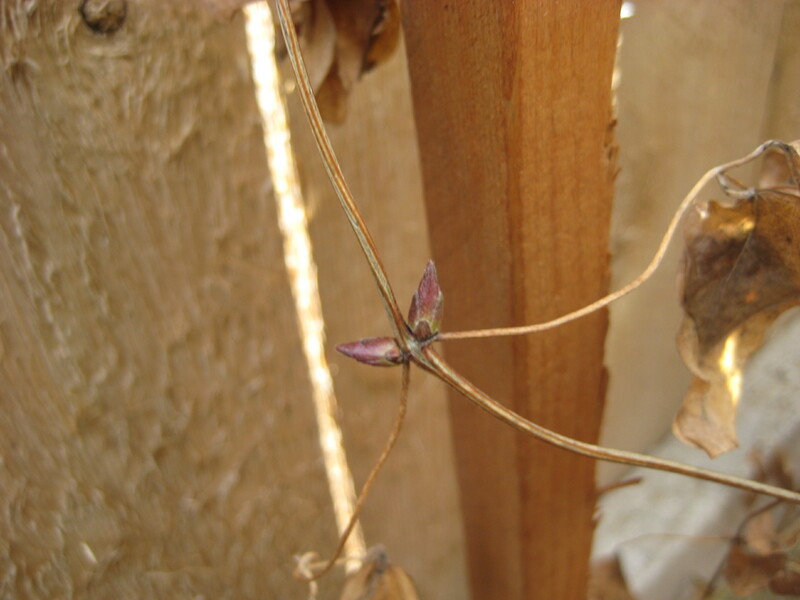 New life on old wood--this is the honeysuckle. 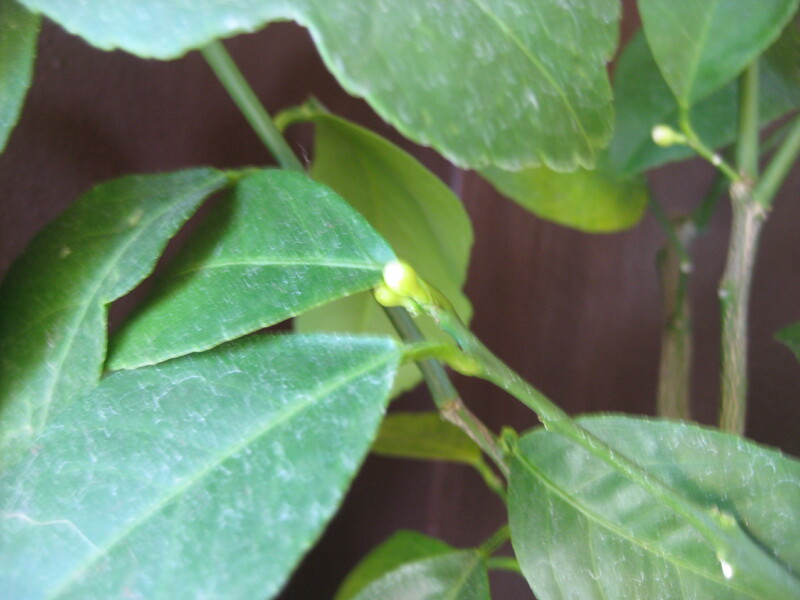 Meanwhile, indoors the lemon tree has set a few tiny buds. 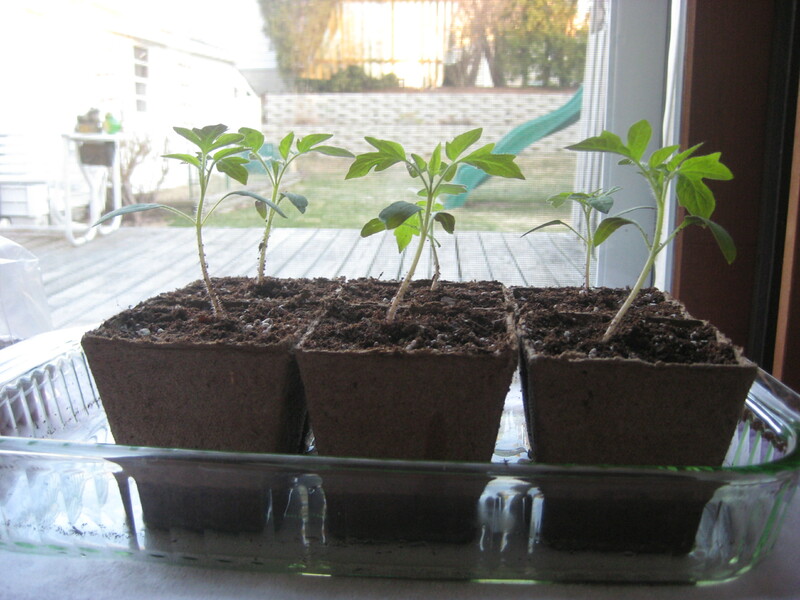 More seed starts--tomatoes, eggplants, a few flowers, many peppers, fennel and cabbages. Filled another 72-cell tray... we will have plenty of plants this year. 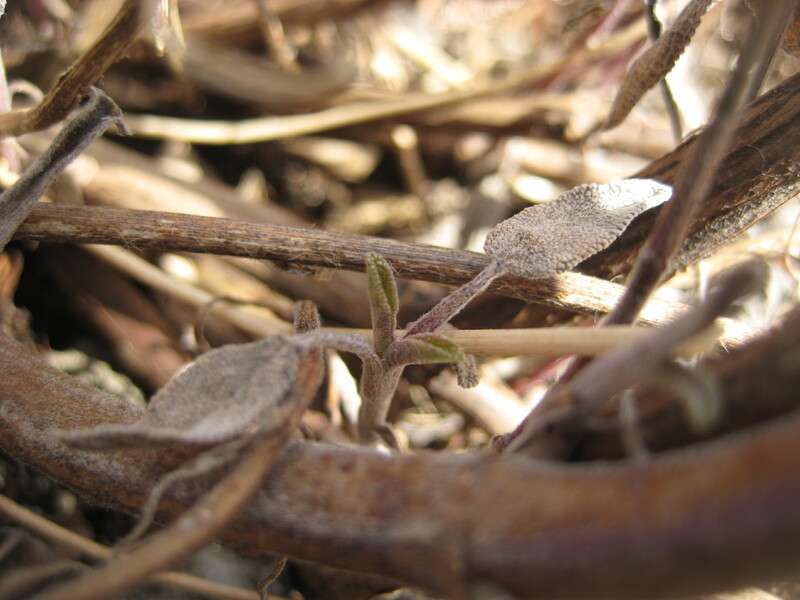 March is here and with it comes the task of transforming tiny seeds into herbs, vegetables and flowers for my (slowly) thawing garden. But first, a confession. I’ve been struggling for a week to write this post. I think that writing from an instructional point of view isn’t working for me. 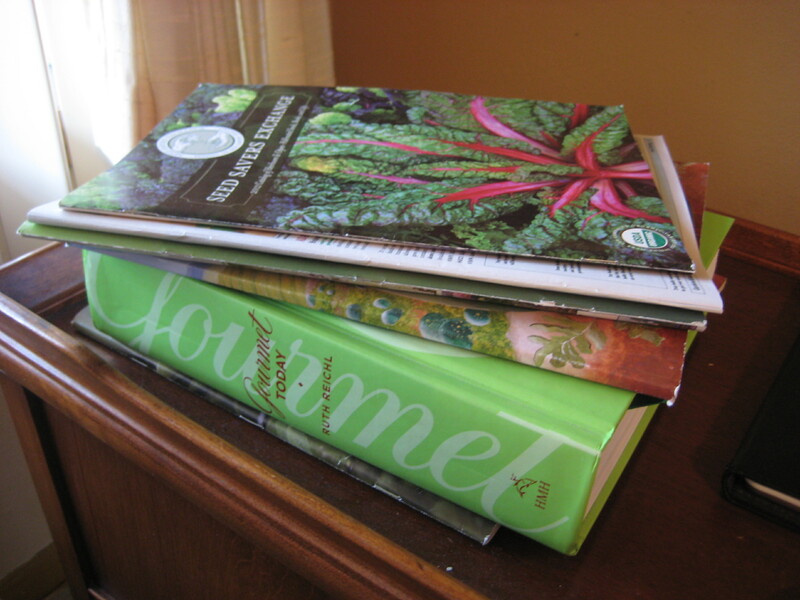 Since there are so many resources available on seed starting, I’ve decided that rather than give instructions I’m just going to report my experience and forget a step by step analysis. It just isn’t my style. Whew! Now I feel free to write. Being a visual person, I like to map my garden, I also like to map my seed trays. 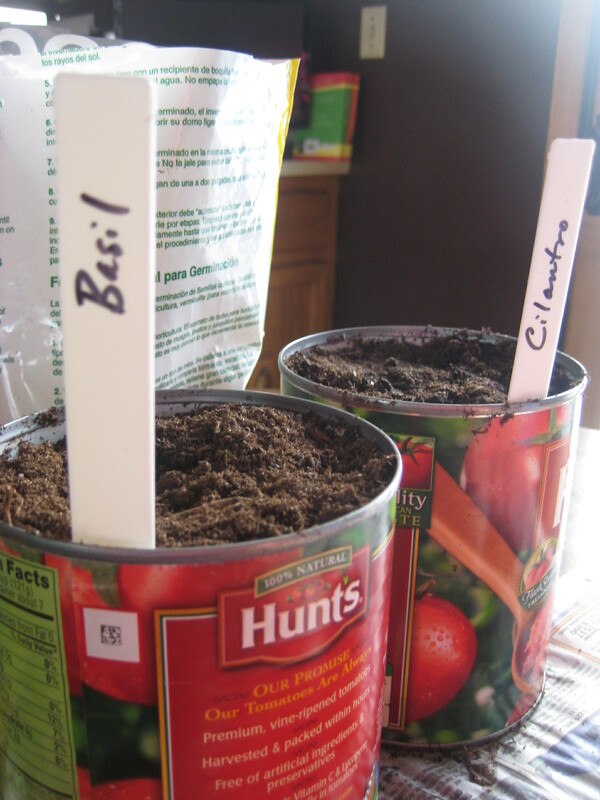 This seems to work better for me than using seed markers, and it feels like less work to me. 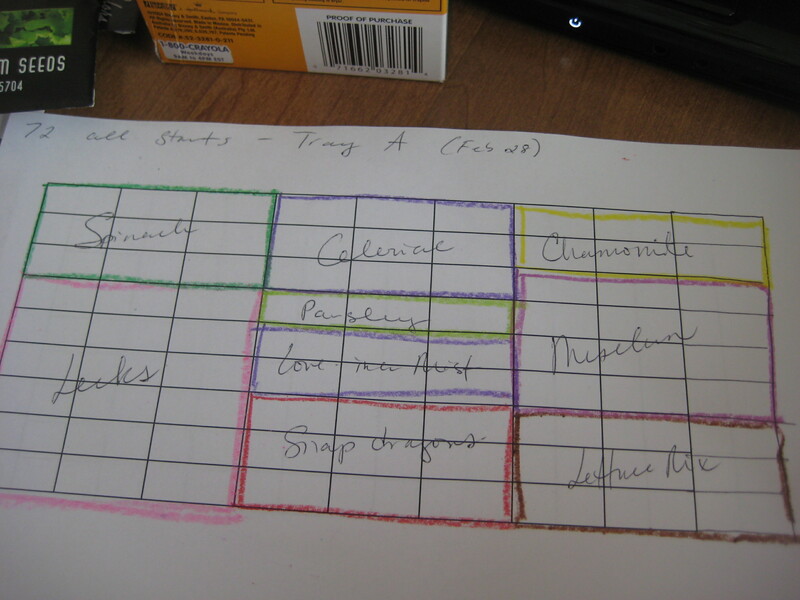 I especially like color coding my seed tray map! 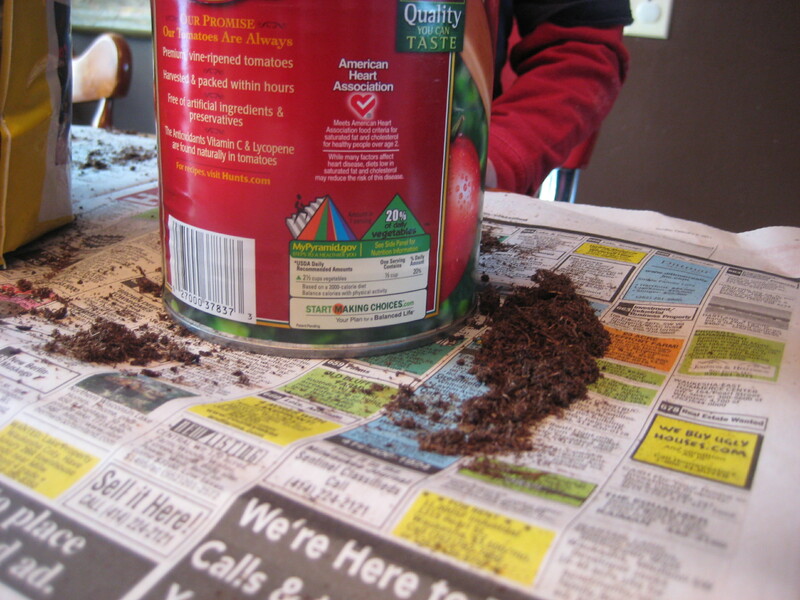 I use a different color for each type of seed. 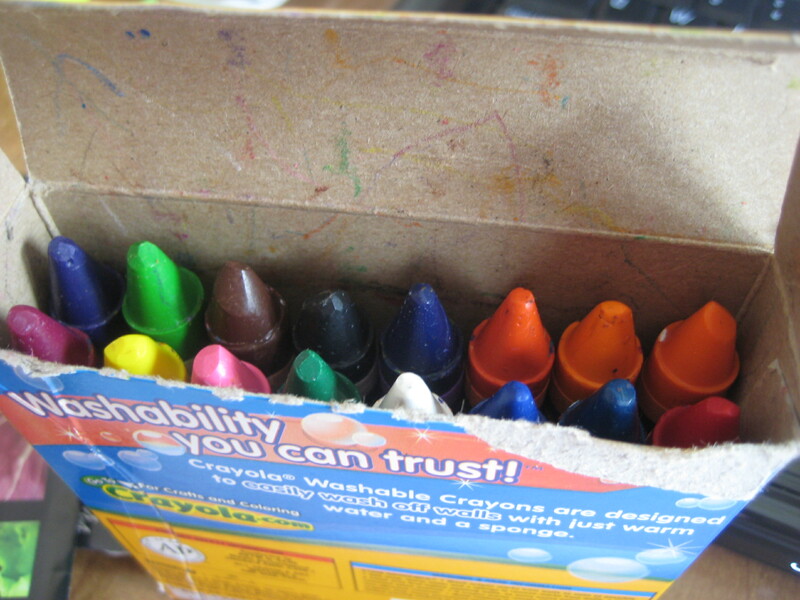 My kids' crayons come in handy for this project. As it turned out, the above map–while lovely–did not have the correct layout for the 72-cell trays I am using. So I had to redo it. Such is life. For this tray, I’m starting some random things that seem like they need more time than others. 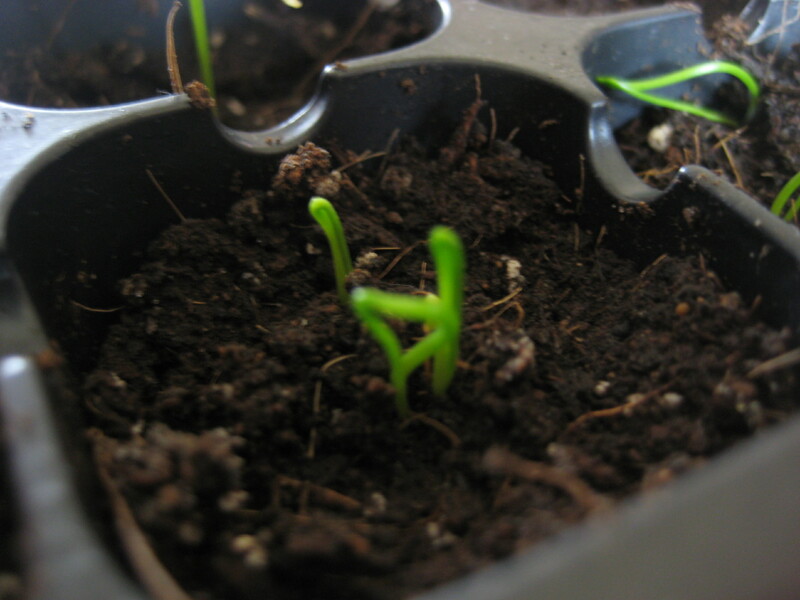 This works out well because by the time these seedlings are done with this tray I’ll be ready to start some more seeds. I have two trays and will probably use each one twice this season. I’m growing some flowers from seed this year, and they’ll take up at least one tray on their own. I use a standard plastic 72-cell tray. These trays come with a drip tray that the cell insert sits in, and a lid. It’s easy to purchase extra cell inserts as needed from my local garden center. 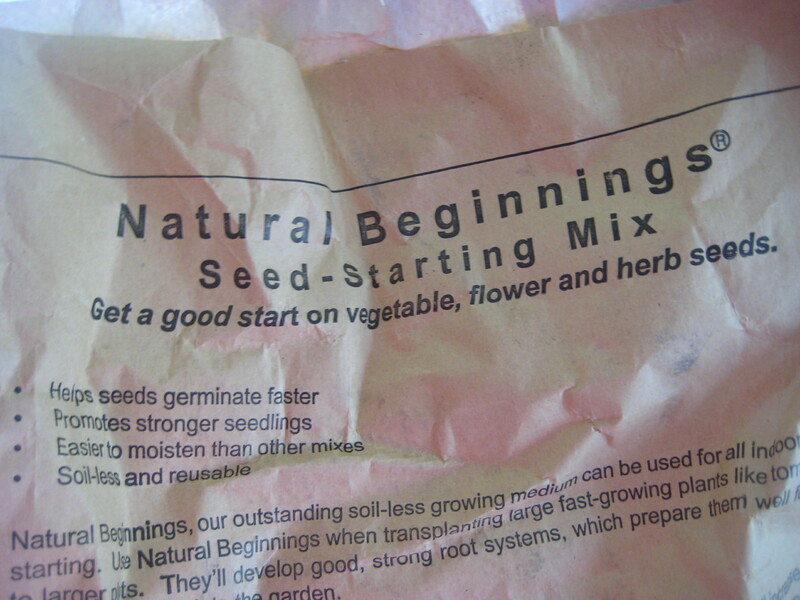 I always read the seed packets before starting seeds. 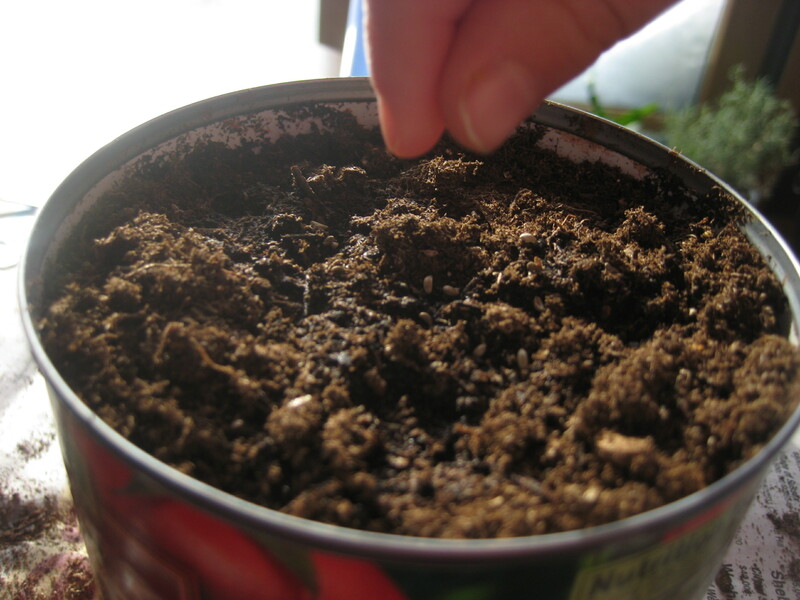 Here is where I can find out when to start the seeds, any special information such as planting depth, sunlight needs, etc. 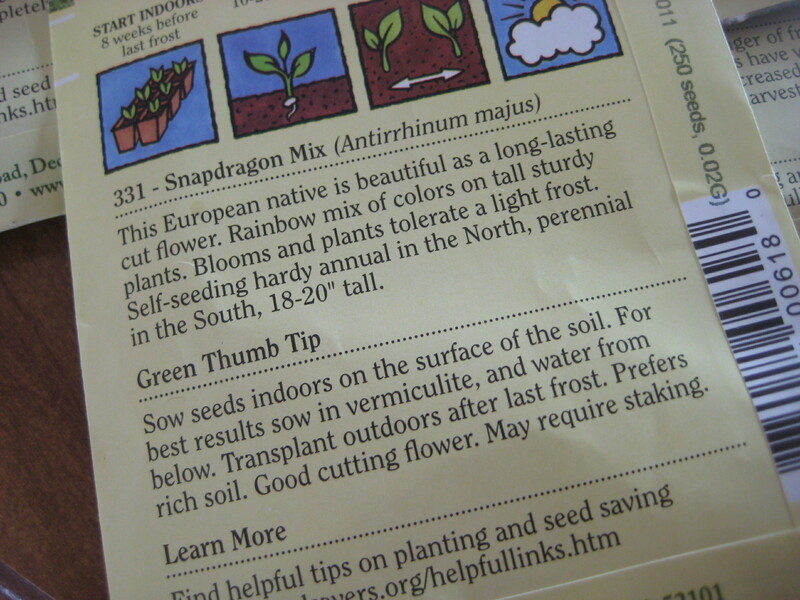 Seed packets contain all the information I need to be successful. 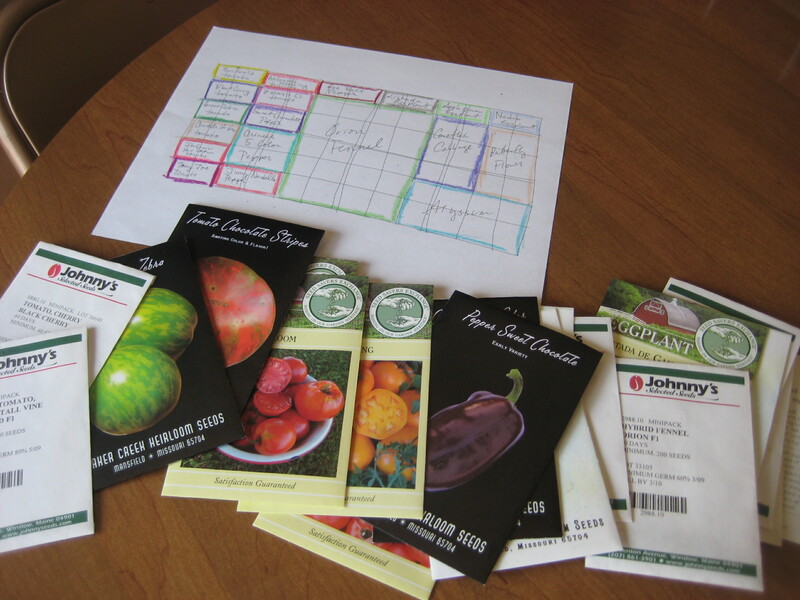 The back of the seed packet is loaded with information for seed starting, transplanting, growing and harvesting. 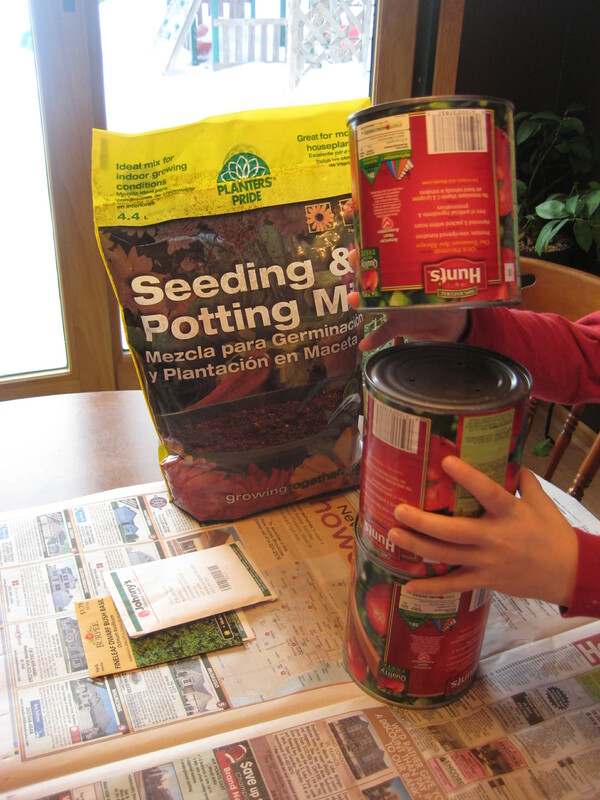 This seed starting mix came from Gardens Alive. I had a coupon for $25 off (I believe every catalog they send has a coupon of some sort) so I used that to order some trays and seed starting mix. 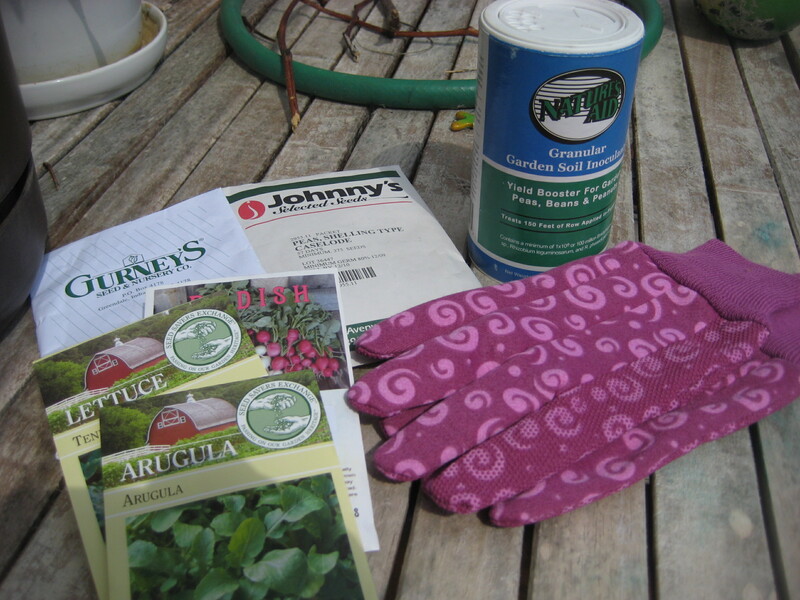 It’s just as easy to visit a local garden center or hardware store and pick up needed materials. My seeds have come from many different sources this year. 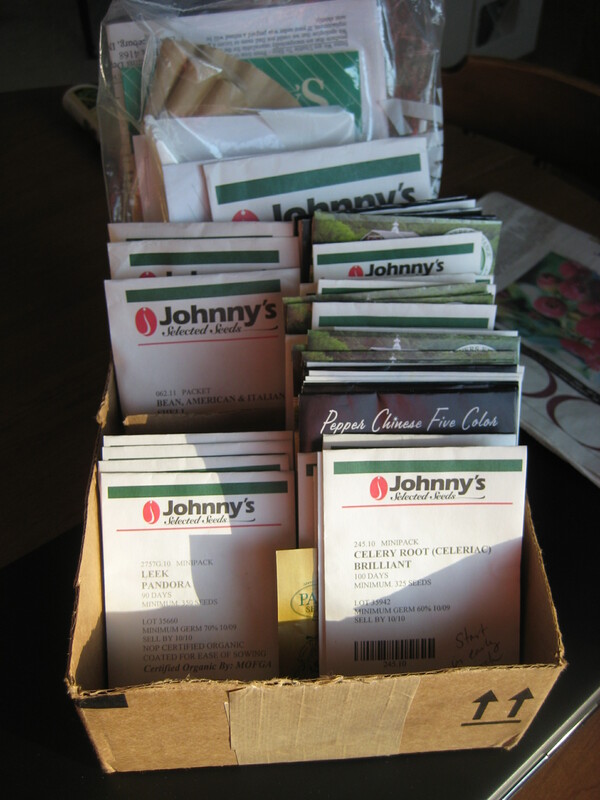 I purchased some at the garden center, others I ordered from Johnny’s Seeds, Seed Savers Exchange and Baker Creek Heirloom Seeds. 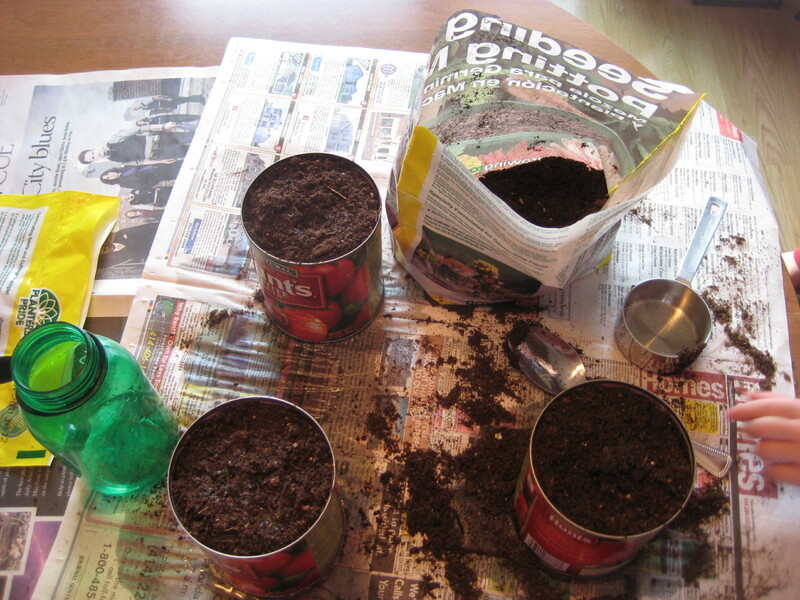 I wanted to try several sources to compare, and also just because it’s fun to collect seeds from various sources. 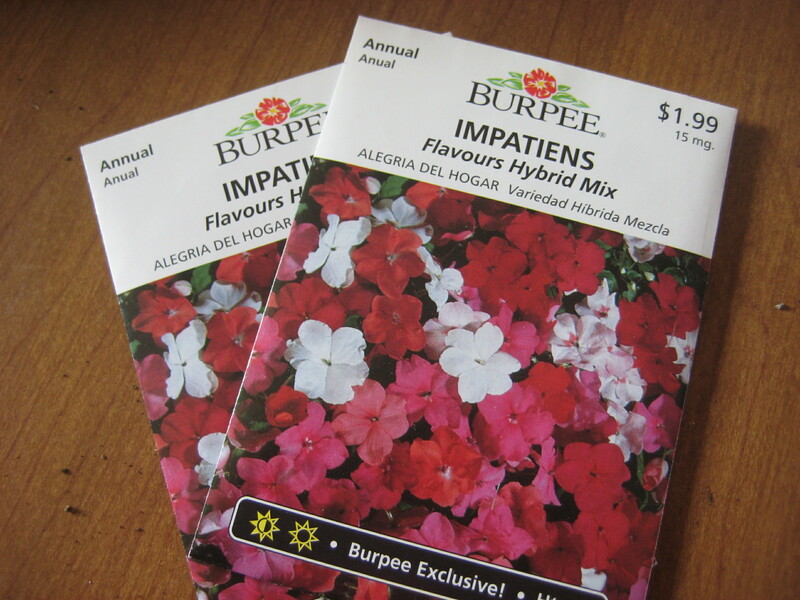 I like the different seed packets. 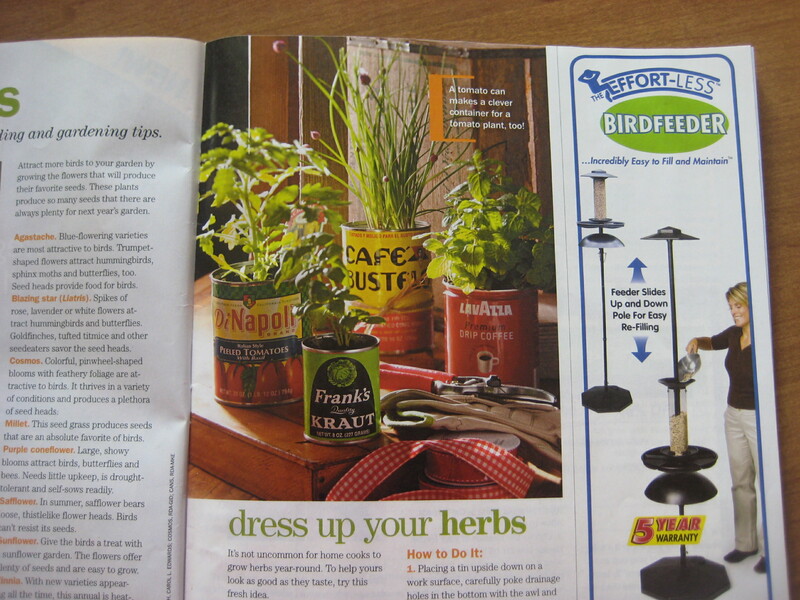 It’s been fun going through the catalogs as well and receiving orders in the mail. 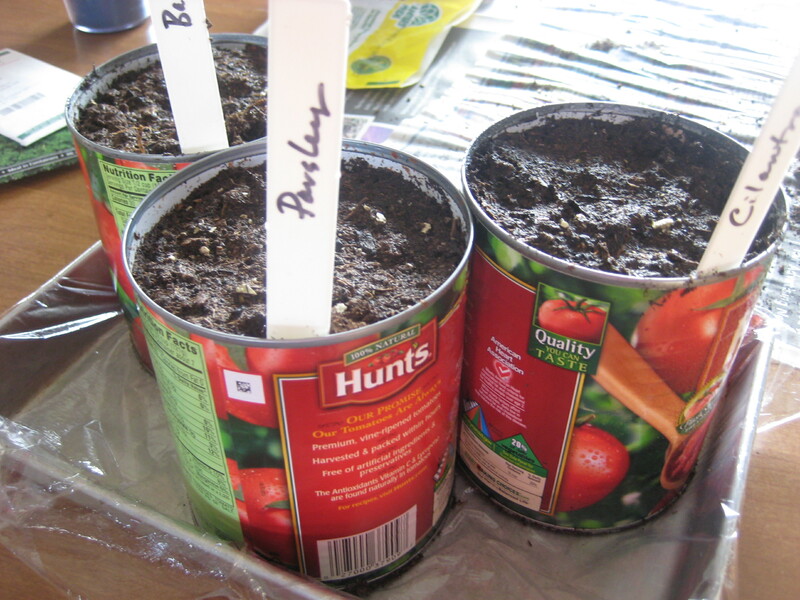 Using my map I carefully put the seeds into each cell after the soaked seed starting mix was in place. Seed starting mix works well. We added water to the mix and spooned it into the tray. 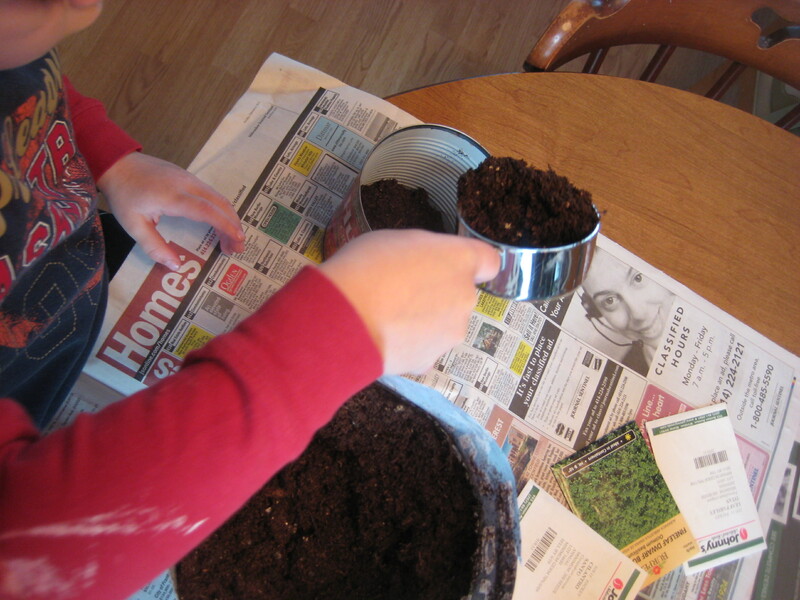 Alternatively, you can put dry mix in the tray and then add water. 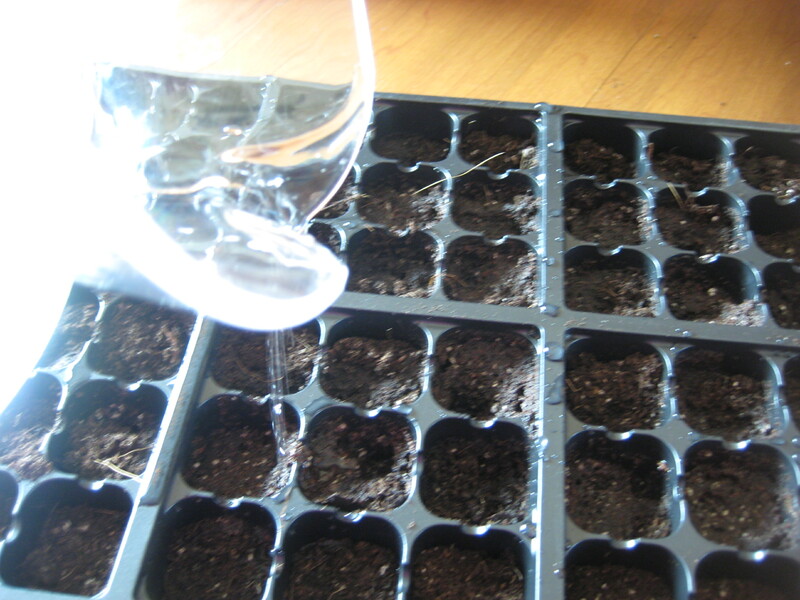 Once the seeds are in, the tray goes to either a sunny place or a warm place out of direct sunlight. I had one tray of each, this information is on the back of the seed packets. 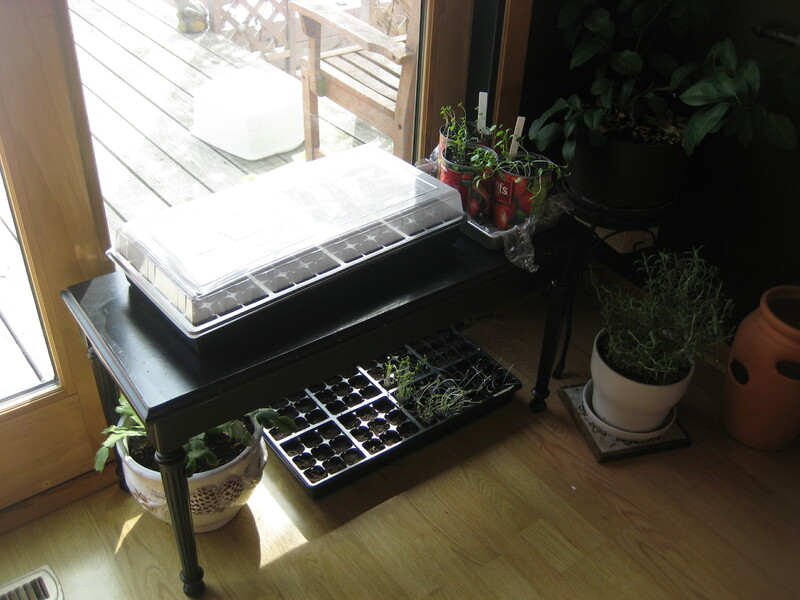 I either put the tray in my bathroom, where it is always very warm, or if the seeds require light for germination they go next to the patio door where it is warm and sunny. 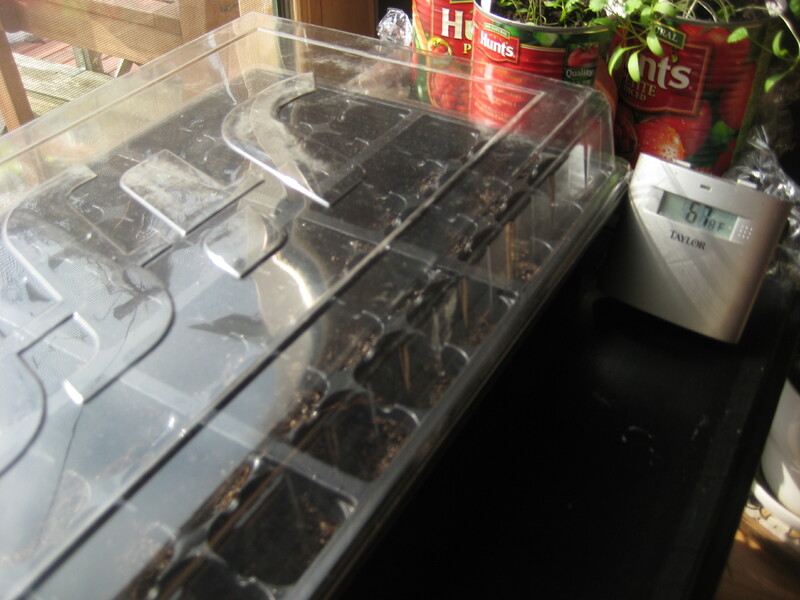 Trays in the bathroom are moved to the patio door once the sprouts emerge. 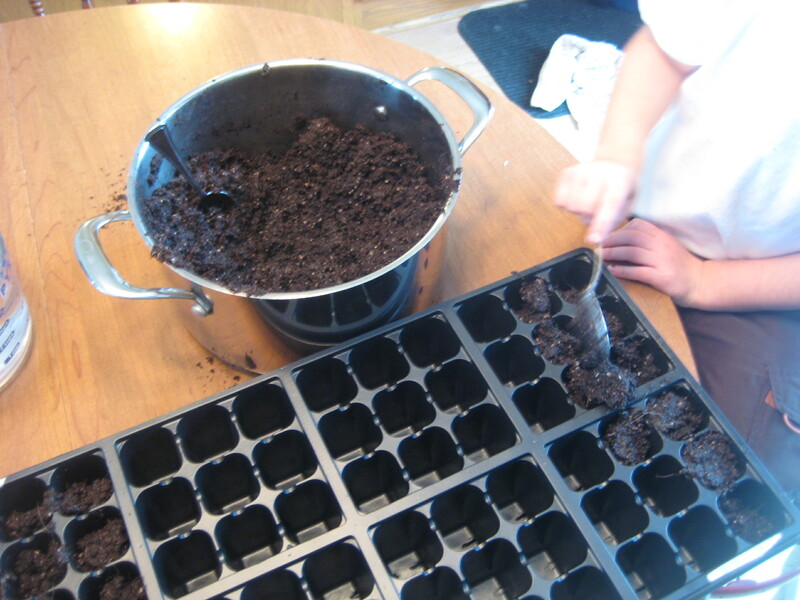 My son and I love to peek at the seed trays every day to see what has poked through. 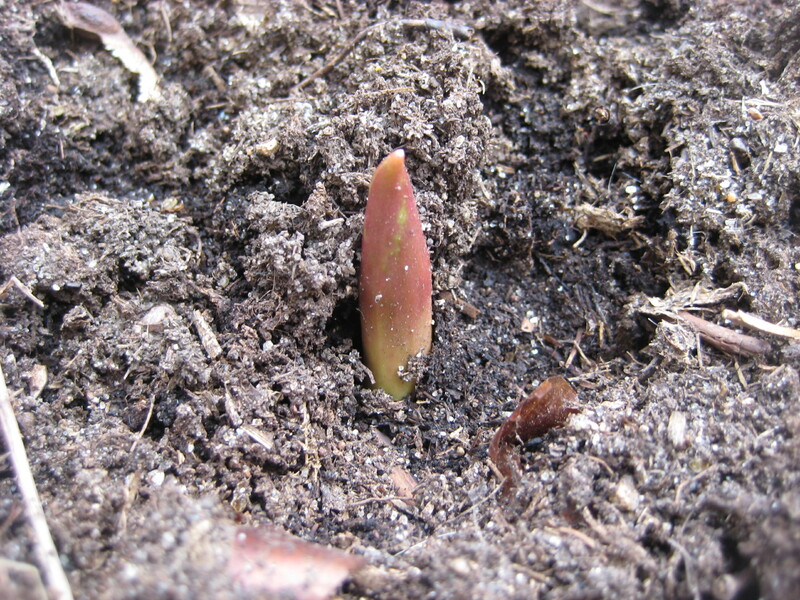 It’s amazing how quickly they change, sometimes they can grow an inch or more in less than 25 hours. 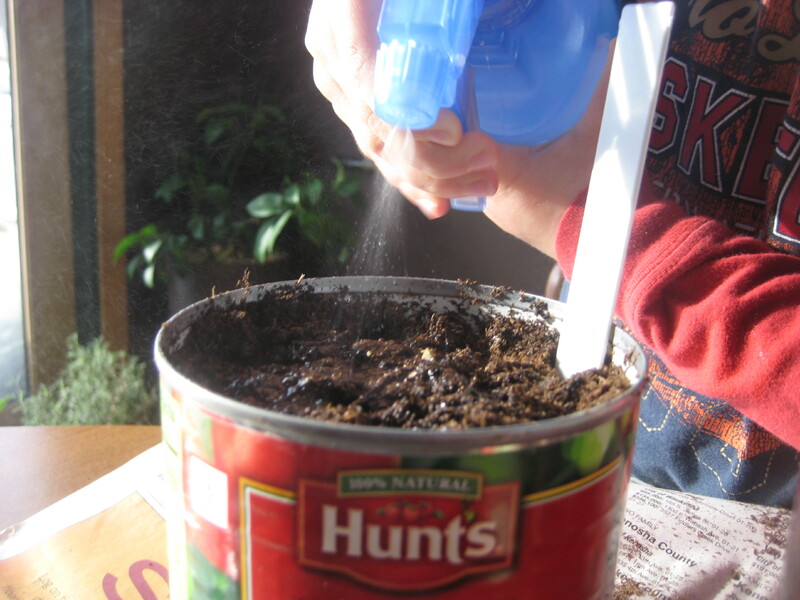 It’s not hard to start seeds. I’ve been doing it for a few years now and have always been pleased with the results. 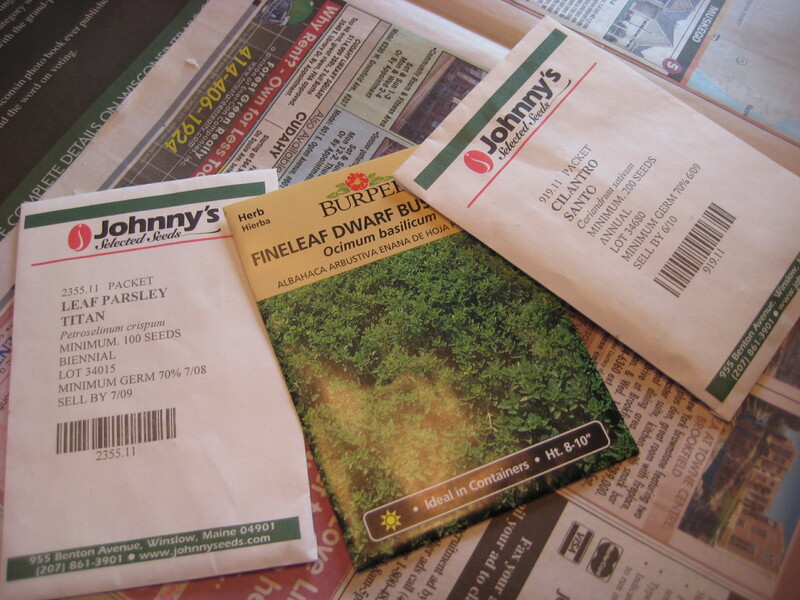 It’s much more affordable than buying plants at the garden center, and there is no limit to the varieties I can grow when I start the seeds myself. I’m not limited by what a store may have in stock. It’s certainly possible to be a lot more scientific about this process. That’s just not me though. I do this by look and feel and rarely consult the numbers. 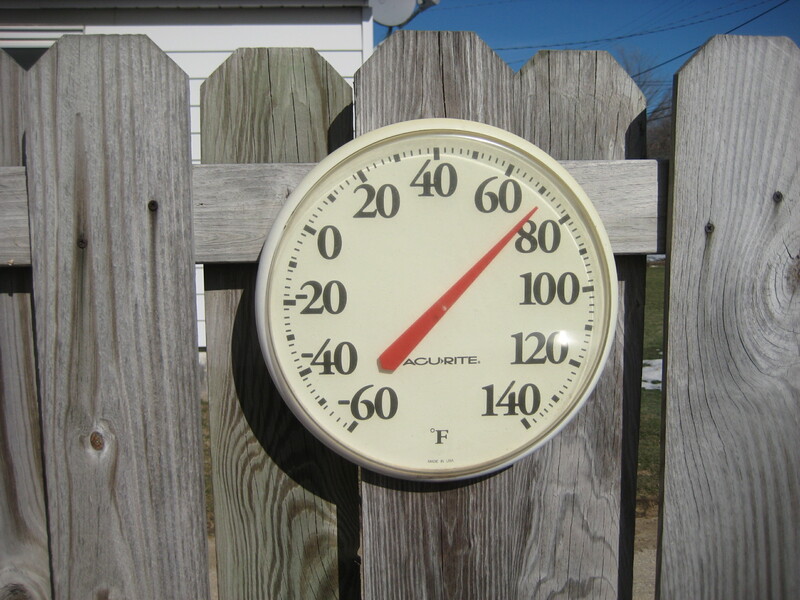 I don’t really know what the temperature is in my bathroom or how many days it takes for seeds to germinate. I don’t really care. (Sorry!) If they come up, I’m happy. 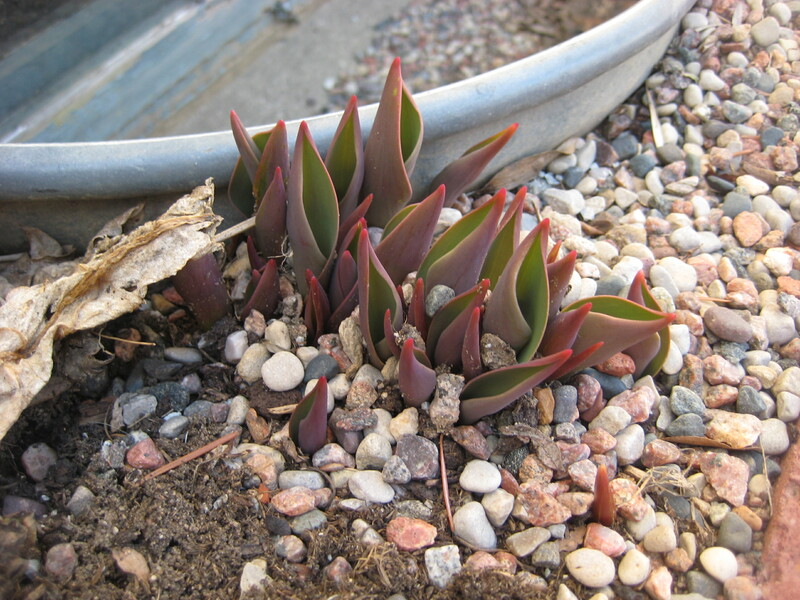 I move them to bigger pots as needed and when the weather feels good, I put them outside. 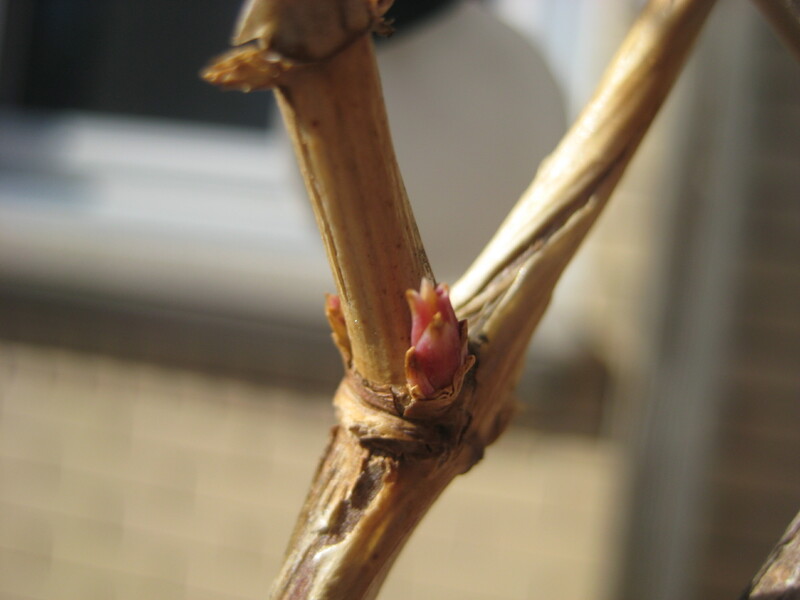 I guess this goes to prove that it’s really not that complicated to grow things at home! I just follow the directions and that seems to work. 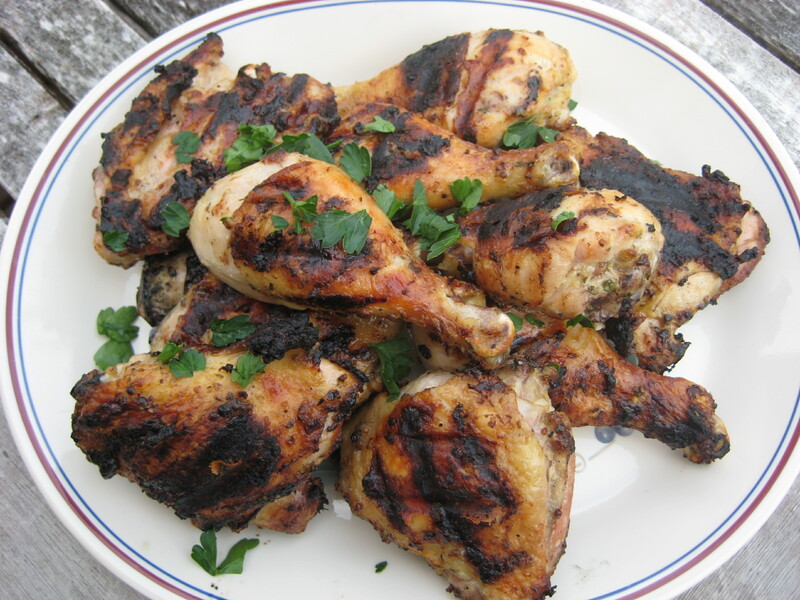 Now, I can’t wait to get everything outside and out of my dining area. 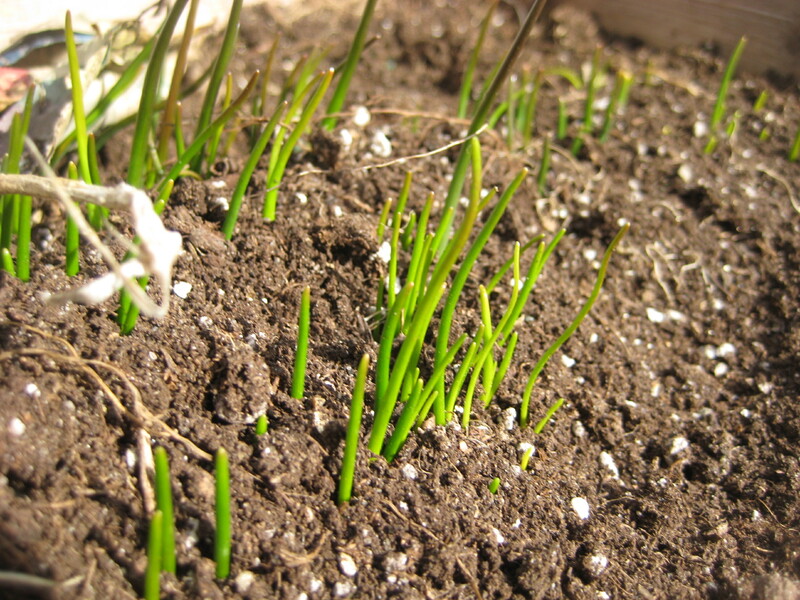 But for at least the next 6 weeks, the seedlings and I will just be hanging out waiting for the earth outside to come alive again. Now isn’t that nice? It’s almost here! 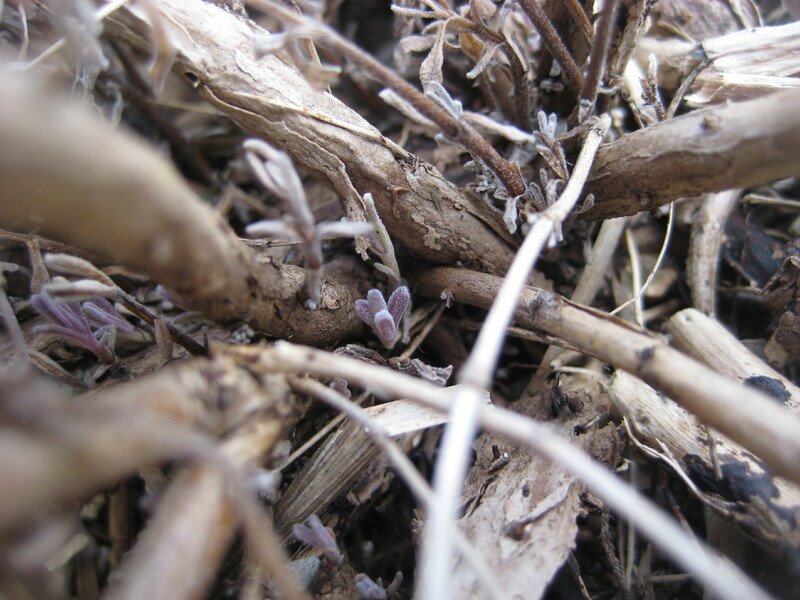 Photos from the fourth week of January. 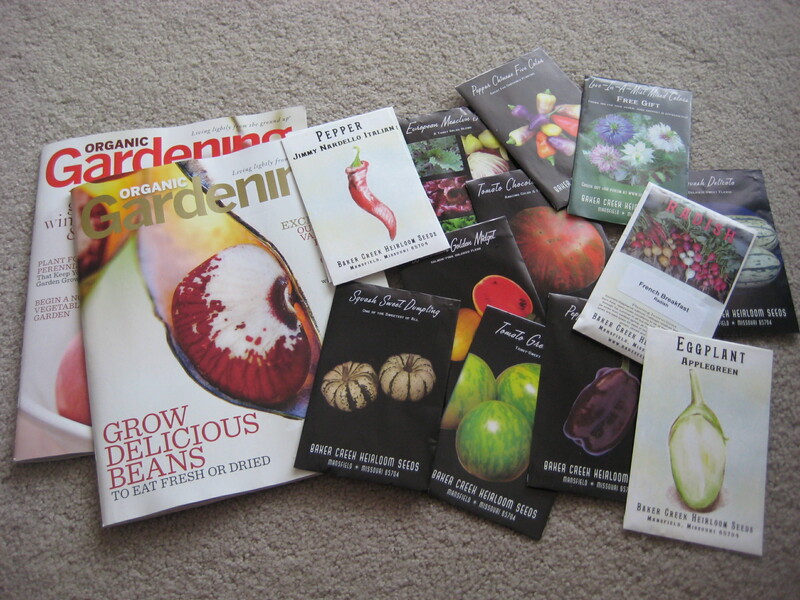 Seeds and a new magazine subscription arrived in the mail this week. 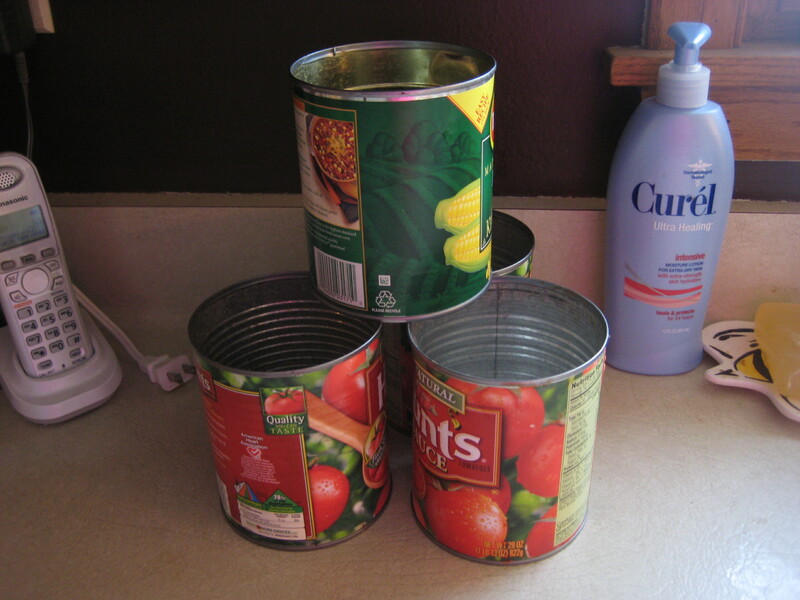 Seed organization. As packets arrive I file them in this box.